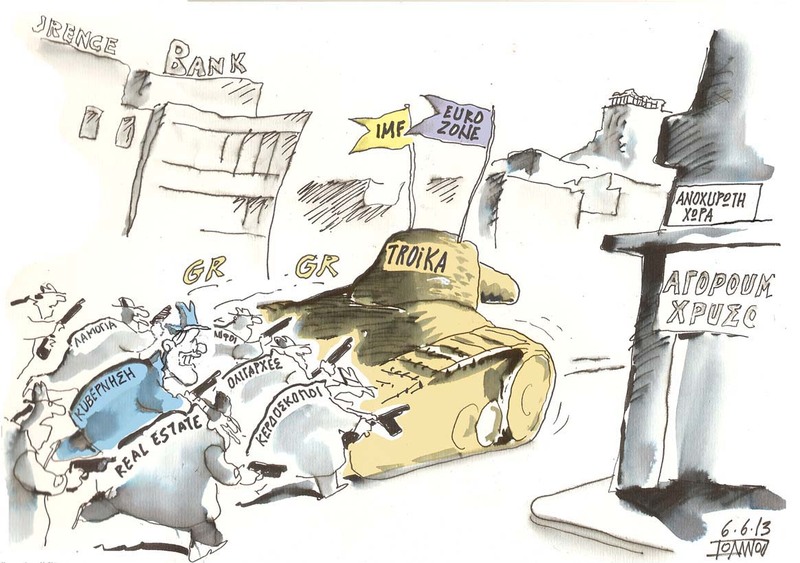 Greek voters have made their view clear. There is not even a single electoral district in the whole of Greece which had a majority for a Yes. I am well aware that if you all had referenda back at home, we would never come to an agreement. So let me not dwell on this or bask in victory. If this were a victory for me, it would be a hollow one, born of the misery, desperation and fatalism of a people who have made enormous economic efforts to right their past wrongs, but efforts which have backfired for them as the debtors and for you as the lenders. If this is no victory for me, it is also not a defeat for you and your peoples. Instead, it is a message which you have heard from Greece today, but which you will hear again and again whenever a member country is in desperate need, whether through its own faults or the faults of others compounding those. It does no longer really matter. Every time, this will be a chance to do things differently, or to raise the destructive spectre of parting ways within Europe. What matters now is one thing and one thing only: the Greek people, the Greek government, the IMF, and many experts agree on one thing: it is no longer worth continuing in a eurozone that has nothing but a deflationary debt spiral to offer when the going gets tough. Such a Eurozone will never function and others will exit or be pushed out in due course. The choice is yours and yours alone now. We, the government, have nothing more to decide. The Greek government has already agreed to practically all measures that were proposed. We continue to do so. But from the start we have said that this is pointless unless it goes hand in hand with measures taken by the institutions themselves to make the debt sustainable. The IMF, arguably the one institution that we both trust more with the numbers than we trust each other, confirms this. In short, we accept all of your conditions under one simple and non-negotiable condition of our own: that the IMF considers our debt unde the new deal sustainable. There is no reason why you cannot make this decision within days. You either reject a Greece which rejects an offer that even the IMF deems unsustainable, or you make the debt sustainable and get a Greece willing and able to engage in the reform you and we have already agreed on. Deciding against it or for it will have the same financial consequences for the non-Greek members of the Eurozone. However, Greece would be bankrupt financially, and the Eurozone would be bankrupt politically if you decide to punish Greece for no obvious benefit to anyone, and for rejecting a clearly unsustainable deal. I trust that you will make the right decision, because Greece has yielded on every political point, while you only need to yield to a simple financial reality. Karl, a few issues with your commentary. First, a victory lap will be high on the Ts[pras agenda, so don’t expect miracles. If he doesn’t high five the Greek people on TV from Brussels, Varoufakis most certainly will. Your point about making enormous efforts to right their past wrongs is also not part of the Syriza vocabulary, and this is not what has been coming across to TV viewers (my colleagues) in Germany the past week or so. Rather, it’s another victory lap with Germany picking up the tab. Next, this idea of the Greek people making a democratic choice flies in the face of the undemocratic manner in which Tsipras has foisted his referendum and ideas in the faces of the other 18 euro currency members. Democracy for one at the expense of 18…Is this the goal of Europe? The IMF issue is moot, and leaked, I suspect. I read their document as an indictment more on the past 5 months of inaction by Tsipras, prompting a meltdown in revenues and the recommendation of another 50 Billion writedown. Greece under Tsipras has nurtured a culture of victimization that runs contrary to the democratic principles of Europe. While it’s right for Mr. Samaras to have resigned tonight, it’s a sad commentary that one of the few political figures who tried to instill some sanity in enforcing existing agreements, must walk away with his hat in hand, while the rock stars of blackmail and dignity almost certainly begin to wreak havoc on an unsuspecting and horribly “victimized” populace. Europe loses, yes, but Greece is finished. If Tsipras doesn’t like my script, maybe the Eurozone leaders could make use of it 😉 what other rational outcome is there? Many of the villains are well meaning, but Greece and the EU is a story full of them, playing their roles right to the end of a Shakespearian tragedy. This story plot runs deeper than austerity versus stimulus; or surplus versus debt. The global monetary system itself appears to be passing its use-by date. The behaviors it induces are destructive of both social cohesion and environmental sustainability. Some very different kind of system has to appear soon. Any ideas?